A Londoner by birth, Insull worked as one of Thomas Edison’s British representatives, then came to the United States in 1881 as Edison’s private secretary. By 1891, he was president of the Chicago Edison Company, which furnished electrical power to the city. 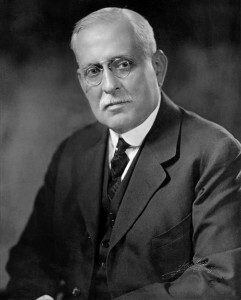 Insull expanded his utilities empire until, by the 1920s, his company was supplying not only all of Chicago, but most of the Midwest. The expansion was achieved through vigorous promotion of the stocks of his complex of holding companies—a practice that put him in a precarious position and caused his financial collapse during the Great Depression. Tried and acquitted on fraud and other charges, he fled to Europe.